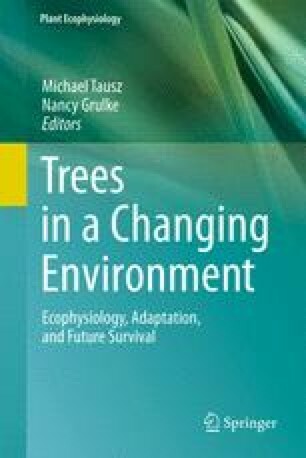 Trees harmonize their growing cycles with the natural seasonal changes, and this is crucial in ecosystems with marked climatic differences between the periods favorable and unfavorable to the physiological activities. Wood formation, or xylogenesis, is a complex and fascinating example of an intermittent, temperature-sensitive growth process that can be investigated at several temporal scales, from daily to annual. The period in which wood formation occurs is the time window when xylem is differentiating and when environmental factors can act directly on the cells constituting the tree ring and, therefore, on wood characteristics and properties. In this chapter, the timings and dynamics of the different phases of xylem cell differentiation are described in detail. The role of some environmental factors affecting xylogenesis at short time scales, such as temperature, photoperiod, dates of snowmelt and soil nitrogen are also discussed for forest ecosystems of cold climates. Although many questions still remain unanswered, the recent findings from monitoring xylogenesis have provided valuable cues for improving the understanding of the physiology and ecology of secondary growth in trees.